Regardless of home décor, or interior design you choose, some elements never change. A couple of pieces of furniture are must-have items, and every home should have them. They often include some basic stuff, like coffee tables, chairs, and accessory that exists in every living space. For instance, you should be equipped with some extra sets for your guests, and you shouldn’t ignore things like nightstands or bed benches. So, if you don’t know what furniture to get, here are a few items that are an absolute necessity. This is an essential part of your living room décor. It is an entirely versatile piece of furniture that can be used as a display space for many things. For instance, you put your decorations here, and also it can be functional when needed. If you want to achieve a stronger visual effect, then you should hand a mirror and a piece of artwork above the table. A display table can be used within any property and even for cabin interior design. Can you imagine a living room without a coffee table? We sure can’t because it doesn’t look complete. It is usually placed between the sofa and armchairs, or in the center of the sitting area. The coffee table is a piece that links all the elements in the living room, and we shouldn’t neglect its functionality. Sometimes floral decorations and other arrangements are displayed on the coffee table to revive the space. Picturing bedroom without ut a nightstand is tough. It is convenient and provides you with an additional space to store books, magazines, smartphone, computer and all the stuff that you might use before you wall asleep. If you are looking for ways to save some space, then built-in nightstand is an excellent idea. Bedrooms that features two or more beds can have a single nightstand placed in between can be enough. But, if you have more room, then getting separate bedside tables is a better option because it provides you with additional space. Drawing a floor plan will save time, money, and your back! 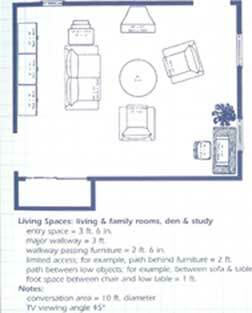 Make your life easier by drawing a floor plan before you buy or rearrange your furniture. You will need grid paper, pencils, and measuring materials. Grid paper comes with various size blocks. Most templates use a 1/4″ grid. You can print off these free sheets of graph paper to help with your floor planning exercises. Write your measurement preference in the bottom corner,(such as: 1 block = 12 inches), so that at a later time, you don’t have to stop and figure out what you used as your original measurements when you were drawing your floor plan. Create an accurate outline of the room you are working on. Include placement and correct size of windows. This is not an architectural drawing and no one is going to be critiquing your artwork. However, the measurements should be accurate and the placement of doors, windows and permanent fixtures should be accurate. Mark placement of the doors and whether they slide or open in or out. Mark the placement of any permanent fixtures such as chimneys and fireplaces. Be aware of and mark heating or cooling elements. Do not block baseboard heating or air conditioning units if you want to get the highest efficiency from these units. Mark electrical outlets and cable or phone jacks. Using the same size grid paper and the same measurement, measure, draw, and cutout shapes of the furniture you plan to arrange in this room. Be sure and do this with every piece, sofas, chairs, tables, television, sound equipment, etc. If you are a visual person and want to physically see your future furniture arrangement, these furniture arranging templates are actually life sized. When you finish this project, you should have 2 room charts. One with your traffic pattern and a blueprint of your room dimensions and permanent fixtures. These kits sell for $39.99 per room. There are also many brands of floor plan software availablethat will save you time when drawing a floor plan. These range from simple to extravagant, depending on the size of your project. If you are a “techie”, you might enjoy drawing a floor plan on your computer. It will also save your aching back from having to move every piece of furniture sixteen times. By moving pieces of paper instead of furniture, you will have the opportunity to explore many avenues of furniture placement you may not have thought of. By setting up some improbable situations, you may hit on the perfect solution that has always eluded you. If there is a piece of furniture you plan on purchasing, but don’t have yet, cut out a piece for that if you wish, using the correct measurement if you have it. This way, if you plan on replacing the sofa or coffee table in the near future, you’ll know it is going to fit into your furniture arrangement. By having the measurements of your doors with you when you purchase large pieces, you will be sure they fit into the allotted rooms. There is nothing more frustrating than buying the perfect sofa, and then having to go back to the store and cancel the order because the doorways are too narrow. This way, if you plan on replacing the sofa or coffee table in the near future, you’ll know it is going to fit into your furniture arrangement. After waiting years for a new stainless steel refrigerator,the big day finally arrived. This may not be an ideal solution for you, but be sure to keep size in mind as you are making decisions about major purchases. Using any of the techniques or products listed above, draw a floor plan of a room in your home. Follow the instructions for measuring and marking doors and windows. When choosing fabric for home decorating just remember there are no right or wrong choices. That being said, there are fabrics the are right and wrong for you and your home. Read these guidelines below and find what fabrics fit your lifestyle, preferences, and decorating scheme. As you are shopping through various types of home decorating stores, the choices available to are often mind numbing. Not only do you have to choose a type of home decor fabric, you also have to consider texture, color, pattern, touch of the fabric, and many other considerations. It’s enough to make anyone develop a migraine and never consider choosing fabric in their lifetime. In order to help you find and choose just the right fabric for the project you have in mind, let’s break this down to basic elements of fabric. Number One: What Do You Like? We all have fabric preferences, whether you realize it or not. What types of fabrics are in your wardrobe? Do you tend to feel your fabric and be drawn to soft silky fabrics? Maybe you like the napped fabrics of corduroy, velveteens and velvets. Perhaps you like the woven fabrics of cotton and polyester. Knowing your fabric preferences will give you a starting place when thinking about choosing home decor fabrics. Once again, look to your wardrobe. What colors call out to you? Are the majority of the colors warm (reds,yellows,oranges), or do you prefer the cooler colors (blue, green, and purple)? Do you like the bright colors or colors that are toned down? Do you have a lot of jewel tones or perhaps you prefer neutrals such as beige and grays? Whatever colors are found in your wardrobe will be a definite clue to your fabric preferences. Does your wardrobe have the general appearance of light or dark colors? As a final wardrobe check, let’s look at patterns. Do you tend to choose solids all the time? Are there stripes and/or plaids there? How about other patterns such as: floral, geometric, nature, people. Now that you have some idea of what you like for fabrics in general, check out home decor fabrics in the fabric section of home decorating stores and fabric stores. For some inspiration and shopping tips check out What to look for when shopping for home decor fabric. Your mission here is not to buy any fabric. You are only going to browse and take note of what you like and don’t like. Take notes and plenty of pictures with your cell phone. Do you always go for the soft, loosely woven fabrics or the harder fabrics like denim and burlap? What patterns do you like? Are they large with lots of space between designs or are they smaller all over designs? Are the fabrics you are drawn to dark or light? 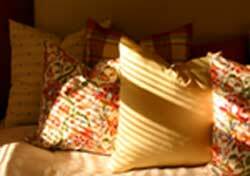 Most likely, the home decor fabrics you are drawn to will mirror the fabrics and colors in your wardrobe. Once you have determined your fabric preferences, you can be sure you will be happy with your choices for home decorating projects. For more ideas on how to shop for and choose fabric for your color scheme. Now that you know what types of fabric you prefer,check out the section on Home Decorating Styles. Traditional to Country , Vintage Style to Log Cabin Decorating , you’ll find a listing of every style here. Find your preference and in that section there will be an area devoted to choosing fabrics for your preferred style. Here you will find inspiration and tips on choosing fabrics that should help you make choices for your lifestyle and home decorating scheme. If you’re uncertain about whether or not a certain color of fabric will fit into your decorating scheme, buy a small item, such as a decorative pillow to try it out. If you aren’t happy with the color or fabric you can always move it to another room, give it away as a gift, or sell it in a yard sale. You haven’t spent much and it’s much better to try with a small item than with a larger investment such as furniture slipcovers or drapes. Hopefully these hints will make choosing home decor fabric easier for you and give you the inspiration you need to choose fabrics with confidence so that whether you are deciding on furniture slipcovers or new draperies for the master bedroom, you know you are making choices you will be happy to live with for a long time. When considering patio decorating ideas, think of your patio as an outdoor room. It is a transitional space where you can enjoy the outdoors while having access to indoor comfort. When I think of patios, I think garden living rooms. Patios to me conjure up semi-private corners of the property, paved with natural stones, furnished with wicker patio furniture, and surrounded by marvelous flowers and greenery. Perhaps you have a totally different vision of a patio, but whatever that vision is, it is most likely of an outdoor private garden spot, where you can relax on a gorgeous day and take time to appreciate life and nature. Patio decoration is an important part of any home landscaping project, and if approached with the whole garden in mind will create a patio that lives in harmony with the rest of the garden rather than one that conflicts with it!. When planning your patio decorating, the first thing to do is analyze what you now have, think about what you want, and decide how you are going to get there from here. Print off the Analyze Your Outdoor Room worksheet here. Take your time to think about the questions and fill them out at your leisure. Once you have this completed, you will have some idea of what you want and what your needs are. Then come back here and read on to gather some new ideas and decorating concepts. Look for antique metal fences at auctions or estate sales. If you can find them, old metal bed headboards make interesting fences. To get the privacy you are seeking, plant and train trailing vines around the fences. Until the plants are established and growing well, plant fast growing annuals like morning glories and train them to grow around the fences. If you want temporary privacy only in the summer season, make a frame of 2/2’s and install it along your boundary lines. String wire or fishline vertically along the frame on hooks about 2-4 inches apart and again plant fast growing climbing annuals. At the end of the season, cut off the lines, break down the 2×2’s and store them in the garage until next season. Old tall wooden shutters make a great windbreak and decorative screen. Attach 3-4 of them together accordion style and spray paint them to coordinate with your patio decorating scheme. Again, these can be folded and stored over the winter season. If you don’t want to totally shut off your neighbors, install long, sturdy, wooden benches along your boundary. Place your large container plants on these for extra height. Place your lawn furniture facing your patio in front of these benches. In this manner you will hide the benches. You will get extra height from the plants and greenery that adds to your sense of privacy but doesn’t create an eyesore for your neighbor. If you have a fence that makes you feel claustrophobic or is blocking a great view, there is no ruling that says you can’t cut a hole in it. A strategic cutout that gives access to a view or allows in more light or air may totally change the way you arrange the seating in your patio decorating, make your space more enjoyable, and still give you the sense of privacy you desire. 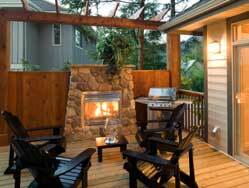 If you carry on various activities on your patio, such as barbecuing, entertaining, and general relaxation, consider zoning your area if you have the room. You may only have a small area available for outdoor grilling, but grills come in all shapes and sizes. Check out my product review for the Weber Portable Gas Grill this little grill is a consistant best seller year after year. Check out what makes this grill so popular. Just because the patio is outside, there is no reason a rug or other floor covering can’t be used to visually separate the dining space. There are many outdoor area rugs available. Canvas floor cloths also work well. Linoleum is available in different size rectangles and is low maintenance. Along with separating the dining area, the rug adds a sense of welcome and comfort to your patio decorating scheme. The relaxation area can be separated with a decorative bamboo screen, a line of plant containers, or merely by placing a wicker sofa facing away from another area and creating a separate conversation area. Be sure to add some smaller pieces of furniture as a convenient place for putting down food and drink. A great way to separate the zones in your patio is with the use of ground covers. There are hundreds of plant varieties that look wonderful, are easy to care for, can be walked on, and add marvelous scents to your patio area. Carpets are there to decorate our home, to make it more beautiful, warmer and more pleasant. In addition, they also protect our floor. However, if you want to keep your carpets in a good condition for a long time, it is essential that you clean them according to their type. Regular carpet maintenance will prolong its lifetime, and here you can find out how to do it. It is necessary to regularly remove dust and dirt from the carpet because many bacteria are collected in it if the dirt is not cleaned. Vacuum cleaners with a Hepa filter are excellent for quality carpet cleaning because they have a high suction power and can extract a large amount of dust. This is a habit that is well-suited to everyday life, because the air in your house will be cleaner, and your carpet will be more durable. Depending on what type of carpet you have, the suction will be needed more often or less frequently. Thick carpets require more frequent maintenance. If you clean and maintain woolen rugs regularly, they will always look like they are new, because they are very good. When cleaning the carpet, use a mild mixture to clean the stain in order not to damage the carpet. Do not rub the carpet, but tap it so you won’t damage the wool. Be careful with the detergent, because too much can damage the structure of the carpet. Once you have finished cleaning, make sure you cleaned all foam from the carpet. Rugged mats have become very popular a few years ago, and now we can see them in almost every home because they go with many styles. Nevertheless, they are not very easy to maintain, because dust and dirt are tangled in tassels. Depending on which material your rugged carpet is, its maintenance will be harder or easier. Woolen carpets must be treated very carefully, while synthetic carpets are easier to maintain because they have antibacterial fibers inside them. The dry wash is best done with granules specially made for this type of carpet, taking into account its sensitive properties. The most dirt and bacteria will be extracted with the help of a steam cleaner, as it passes deep into the carpet pores. Persian carpets are known as high-quality rugs, which can decorate the homes of several generations of a family. Nevertheless, Persian rugs are a bit more sensitive than other carpets, so it takes a little more time to take of them. The classic cleansing we have listed above is implied, and in addition, from time to time it is necessary to clean it on the other side, in order to remove impurities. Cleaning the Persian carpet is best done with a simple broom, as its longevity will be preserved. It is important that you do not use vacuum cleaners with rotating brushes. From time to time it’s good for your house and for your mental health to completely rearrange a room in this house and give it a new vibe. Room arrangement is a resolution that you can easily fulfill and you will be very satisfied. Read tips on how to rearrange the room without spending too much money. You do not need to buy new furniture, it’s enough to let your imagination run wild. Small changes can mean a lot. Just clean the room, and correct a few things. The basic thing that we do when we want to rearrange the room is to arrange the furniture. Make a plan, and measure every piece of furniture correctly, because you need to make sure that your ideas will be successful even before you begin. Your idea can be great, but if you can not slide a piece of furniture through a doorstep, a great idea will remain just an idea. Measure the doors, windows, stairs, and you will greatly ease the work in advance because you will not end up with furniture in the middle of the room and in much more chaos than before. Maybe it’s best to make a plan on paper, write out all the measures, and then try to incorporate your idea into the real space that you have. But before all that, you need to decide what will you keep in that room, and what furniture should be left out of that future room look. So make some choices and see what pieces go together and what are the ones that are just taking up space and the room vibe. All the garbage and things that just collect the dust in the room should go outside. When you throw away garbage, you will have plenty of space to arrange the room as you like. In addition, garbage disposal positively affects our psyche, and after that, we feel very relieved and sluggish. It will feel unbelievable how many unnecessary things you’ve been keeping for years in the room. The best thing you can do for yourself is to clean up the mess, and your room will look fresher. Now you will know how to rearrange the parts of the room that stayed. Wood pallets, used for the transport of goods, are often rejected after delivery. What’s exciting about wooden pallets is for how many different uses they can be used! They are usually made of softwood, although it is not unusual to find hardwood made of oak or maple. They are solid because they are designed to carry hundreds of pounds of weight. And the used palettes look old and rustic, which is the perfect medium for ideas and palette furniture projects. One of the simplest ways to use a palette to make furniture is to make your ideal table in the living room. All you need to do is to put the palettes one on top of the other and to repeat that until your table gets high as you wish it to be. You can stick them with wood glue one after the other, or fix them with nails and screws. Add wheels to your pallets and your table is ready. Such a table will give your living room an industrial look. Coloring palette is easy and can change the look from industrial to modern. For the better appearance of the pallet table, first you should polish, or you could just paint it in whatever color you want. You can add color in a creative way so that one pallet is colored in contrast to the other. This will make your coffee table even more interesting and give it a modern, and perhaps even futuristic look. On your table, you can put a wooden panel or toughened glass. The glass is probably better because it will improve the look of the table. Since there is plenty of space between the pallet boards, you can store various things like books and newspapers you often keep in the living room. But this kind of table can be used anywhere not just in a living room. 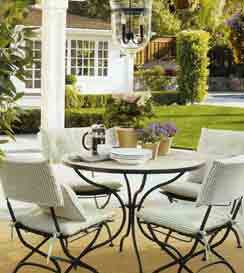 This table can be ideal for small terrace because it will give that space a more natural look and positive vibe. You will be amazed for sure. If you are not quite sure what should you do with all those empty walls you have in your rooms, or you wish to decorate them differently than they are, worry no more. In this article, there are various ideas that will inspire you to make something unique and amazing. If you have a wall that is completely empty, you can easily refresh your space – you can hang fabric on it. It is best to hang it over the entire wall. This way you will avoid using the wallpaper that is quite common and already seen. If you choose material that has a beautiful pattern and full color, the whole room can get an avant-garde, futuristic or oriental look. Plates in unexpected colors will refresh the wall. It is important not to have the same size or texture on the plates. Put the most dramatic design in the center and hang the others around it. Such wall decorations are most common in kitchens. In this way, you will get an ethnic look and if the plates are especially beautifully painted and decorated, or if they have a golden color on the edges, you will also get a look from the world famous magazines. Your kitchen will look amazing. If you have a very nice frame and you do not know what to do with it, do not despair. You do not have to spend hours looking for a perfect photo that will highlight the beauty of your frame and be able to match it. You can just paint something yourself. And you can hang the empty frame within which the wall will be the other color. In a nice frame, you can put any kind of inspiring text or a song. Certainly, in old albums or on your computer, you have incredibly many pictures from some important event. Perhaps these are photos of you and your family when you were young, or photographs from your wedding, birthday, vacation or some other important event. Collect all the photos that you like that are linked to the same topic. Put all these photos into identical frames and hang them on the wall chaotically arranged but close to each other. In this way, you have turned your wall into the thematic space of your particular memories. You like the way a specific room in your home looks like, and you like spending time in it. Every furniture is in its place, and everything is fitted according to your taste. However, when you enter that room, or when you spend a long time in it, you feel that something is wrong. Something just does not fit. Is it too monotonous, or is it too simple? Perhaps there are too many complicated parts of the furniture? Something is just not as it should be, and this vibe slightly spoils the feeling of the entire room. But you should not be worried because we bring you two simple ways to refresh the room without having to spend too much money. Nothing will refresh the room like recycling old furniture. It is very possible that you have furniture in a room that is in comparison to other furniture, just the wrong color. Perhaps all your furniture is monotonous, and if you repaint one, it will make all of them look good. You can upholstery furniture again, but for that, you will have to spend some more money. If you have an armchair in the room that does not look good with your bed, wardrobe, and shelves, you can apply the decoupage technique to the wooden parts of the armchair. With the decoupage technique, you can make genuine furniture, designed to your liking. You can make a room in a romantic style, urban, traditional, or any other. You can change all the wooden surfaces in the room and thus get a brand new room. In addition, you can paint the wood parts in your favorite colors. Painting your walls in a different color will bring a big change to your room. Just let your imagination run wild and do not limit yourself to white or beige. You can paint one of the walls in a different color than the others, you can choose a pattern that will repeat only on one part of the wall (and this pattern can be in the same color like a wall, only different shades). You can decorate the wall with interesting wallpapers as well as drawings. Think about changing the color of the ceiling, because if you hit the right color, the painted ceiling will give the whole of your room. If you have good lighting, the light pink color is an excellent choice because it will make your room romantic and pleasant. This can bring a lot of freshness and novelty into your space, it’s only important that before you do it, choose your new colors carefully. The colors we are exposed to will affect our mood depending on several factors: the color itself, the intensity and duration of exposure to that color, as well as the subjective factors, such as the preference of a particular color. We feel better among the colors we love, which complement the space and enrich it. In the context of a psychology of colors and interiors, it is necessary to take into account individual differences among people, even though we are somewhat biologically conditioned to experience colors in a certain way. Lawyers choose serious colors, banks try to be simple and businesslike, hotels try to satisfy a variety of tastes. The choice of colors is secondary; It is primarily the furnishing of space in a certain way, with colors being only one of the factors to be taken into account. Nevertheless, they are a factor that significantly influences the formation of the impression, and therefore deserves the attention of all those who deal with space. Although colors have the impact of limited duration on people and are largely dependent on individual factors, productive colors are considered to be blue – the most common choice not only for the interior but also for the visual identity of corporations and technology brands; as well as green. These colors come in many shades. Likewise, one can become irritable in the middle of exposure to red, and someone will exactly paint their bedroom in that color. The combination of white with some pastel color is always a safe move, because the room will be bright and spacious, and the ambiance will give the impression of ease. Colors always choose according to their own affinities, while respecting the general rules of color matching. A certain color becomes a living if it is complementary in the vicinity, but loses freshness if it is not the case. The old rule implies that the most commonly combine to a maximum of three colors, and apart from the color choices, the relation between their application and rule 60-30-10 is also important.